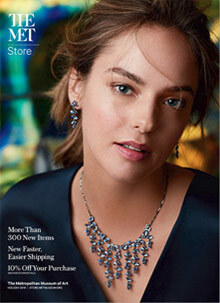 Browse The Metropolitan Museum of Art catalogue of unique gifts and exceptional collectibles inspired by famous art. Each reproduction and publication is the result of careful research and expert execution by the Met's staff of art historians, designers, and master craftspeople. As always, proceeds from the sale of all products in The Met Store directly benefit the Museum's collection and programs. History's finest jewelry - The Met Store offers a unique selection of jewelry that draws inspiration from a Museum collection that spans thousands of years, across the entire globe, with pieces modeled after everything from ancient Egyptian necklaces to early twentieth-century French evening wear. Elegant scarves and shawls - The collection of scarves and shawls is just as distinctive. The best of ancient and modern art styles is reflected in their rich colors and intriguing motifs, and timeless wool and silk designs can add a flourish to any outfit, any time of year. Beautiful art books and sculpture - Informed by the height of art and historical scholarship, our selection of books covers modern and classical masters, exploring topics as varied as the Met's collection. The sculpture reproductions we offer are no less authoritative. Whether cast off the artist's own molds or rendered using the latest in imaging technology, our sculptures are a great way to bring art into your home. Children's gifts and toys - The Met has not forgotten their youngest patrons. Choose art books for toddlers in sturdy board-book style, special Museum publications, and other art books for older children, plus building sets, stuffed toys, play sets, and more.